ONE SUMMER HOLIDAY SLOT LEFT! Get Your Tribe To Mangawhai! An Entire Retreat Exclusively For Your Group! Treat your group to a short break away from the ordinary! Tara Retreat is an evolving glamping and eco accommodation space - space for relaxation, space for privacy, space for play - it’s the perfect space for your group of friends or family to get the most out of Magical Mangawhai! Tara Retreat is just minutes away from Mangawhai Village, weekend markets, Bennetts Chocolatier, Dune Café and the Mangawhai Tavern, wineries, olive groves, a golf course, lovely bush and coastal walks and of course many great beaches! 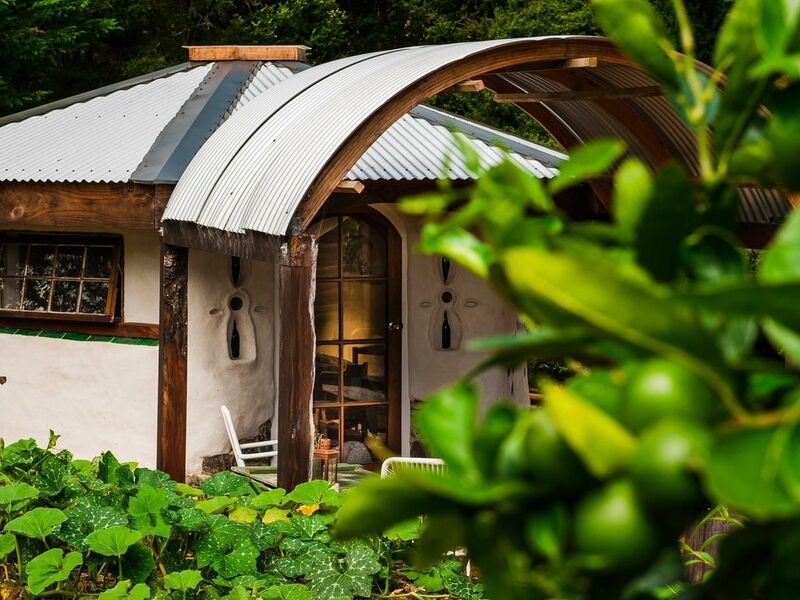 This rural getaway has five unique accommodation options - a self-contained studio, a handcrafted cob cottage, a spacious house truck lined with native timbers, a renovated caravan with its own covered deck and a comfy glamping tent. All set amongst two acres of orchard trees, citrus and banana groves, vege and herb gardens and native bush. It is an ideal place for a group to holiday away together as you will have the whole retreat to roam around in. Each accomm option has its own private setting for enjoying a lovely local wine in the afternoon sun, but your party can meet up in the fully-equipped outdoor kitchen for a BBQ, listen to some tunes and dine al fresco together - yay! The property also boasts a yoga studio which can magically transform into a dance floor at night, some hammocks for lounging, and rural, garden & bush views. Come and make yourselves at home this Kiwi summer! Check in - 2pm Check out - 11am. We returned to the area where Nic grew up & had a vision to create a retreat with unique accommodation using natural, recycled or reused materials where possible. We also wanted a wee bit of bush, gardens & orchards. We love people enjoying Tara Retreat in whichever way they need - to relax, cook, chill, meet new friends, hibernate, be active, raid the garden. We live onsite and are mindful of giving our guests privacy but welcome questions or chat as well. Tara Retreat is just minutes away from Mangawhai Village, weekend markets, Bennetts Chocolatier, Dune Cafe and the Mangawhai Tavern, wineries, olive groves, a golf course, lovely bush and coastal walks and of course many great beaches! Shared outdoor kitchen/dining containing a fridge,/freezer, gas cooker, BBQ and all essentials supplied. The studio has a self contained kitchen. An eco rustic getaway for a family or friend group to enjoy being together but have own spaces too. Onsite yoga, massages, games available too. Close to town and vineyards. Close to town and vineyards. Cute house with everything you need. Tara Retreat was conveniently located for us on the road north. Tara Retreat was conveniently located for us on the road north. The cottage itself was quirky and cosy with the heater left on for our arrival and the bed was seriously comfortable. I want to start off by saying the location was splendid, situated in the quiet of the country. Central location, and easy to book. Awesome place to get away on holiday with our dogs. Lovely set up ... has everything we needed. Magical Mangawhai known for its beautiful surf beaches & estuary for paddleboarding, fishing & kayaking. Several scenic walks including the Beach Cliff top walk, bush & waterfall walks. Bennetts Chocolate shop for handmade chocolate and the Saturday farmers market. Top notch skate park & bowl, includes many activities in the park for children, mountain biking, fitness zone.